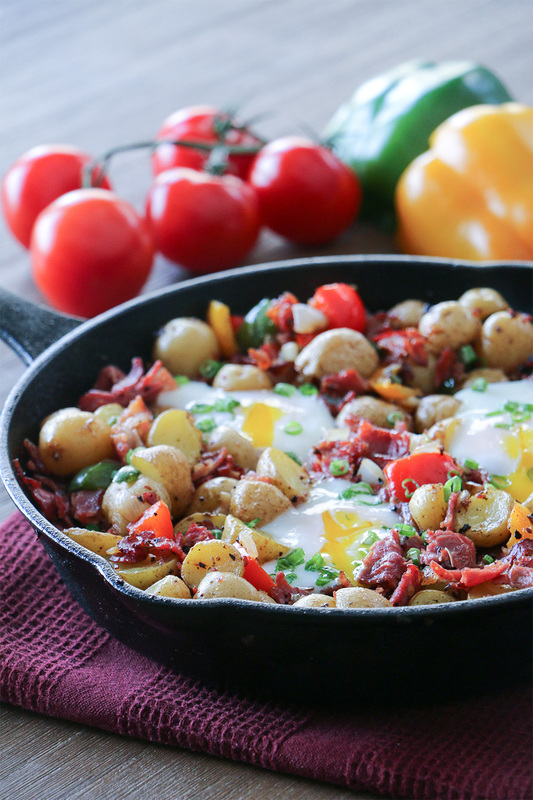 I have a confession to make… I’ve recently become addicted to my cast iron skillet. This is a big deal for me because I used to dislike using it. I wasn’t fond that it was heavy or that it came with a list of rules you had to follow in order to maintain it:seasoning it properly, not using soap when cleaning it (apparently not true according to my idol Kenji), or drying it thoroughly so it didn’t rust. However, recently my boyfriend (Kevin) reintroduced me to the world of cooking in a cast iron skillet and I love it now! 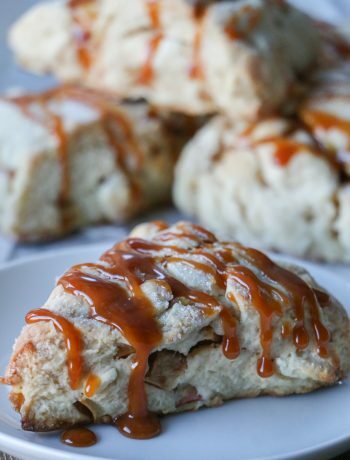 Best of all it makes for good food pictures and it can be tossed in the oven without worry. I use it so much that I’m beginning to think I have a problem, but Kevin doesn’t seem to care as long as he is fed! The best thing about making hash browns on the weekend is that it’s an easy excuse to use bacon, not like you need an excuse to use bacon. Not only is the smell amazing, but you get to have leftover bacon grease to add to everything your heart desires! There is no right or wrong way to do this. 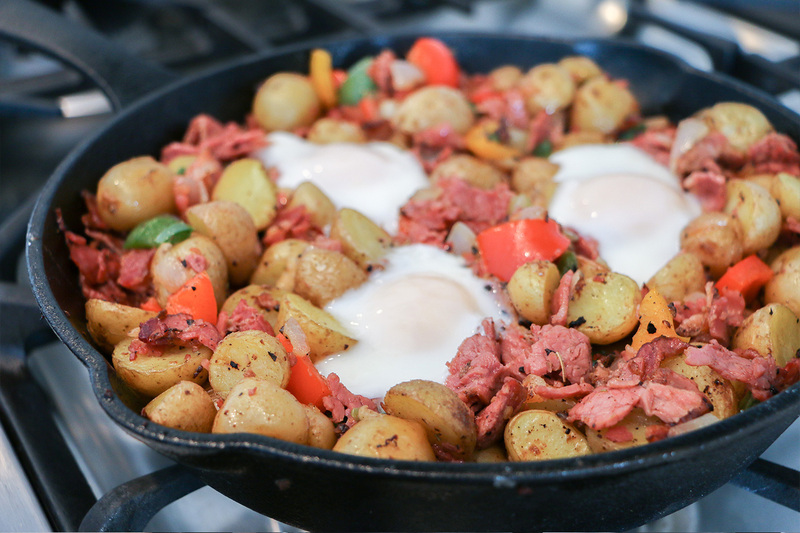 All you need is some veggies, meat, and potatoes. You can make a multitude of different variations of this with by combining different kinds of vegetables and herbs and spices that complement each other. Kevin had bought some Montréal smoked meat earlier and I think he was hinting that he wanted it in his breakfast so that’s what I used. My preferred method of cooking these ingredients is to do them in batches, so that the pan does not get too overcrowded, allowing for browning and not steaming. 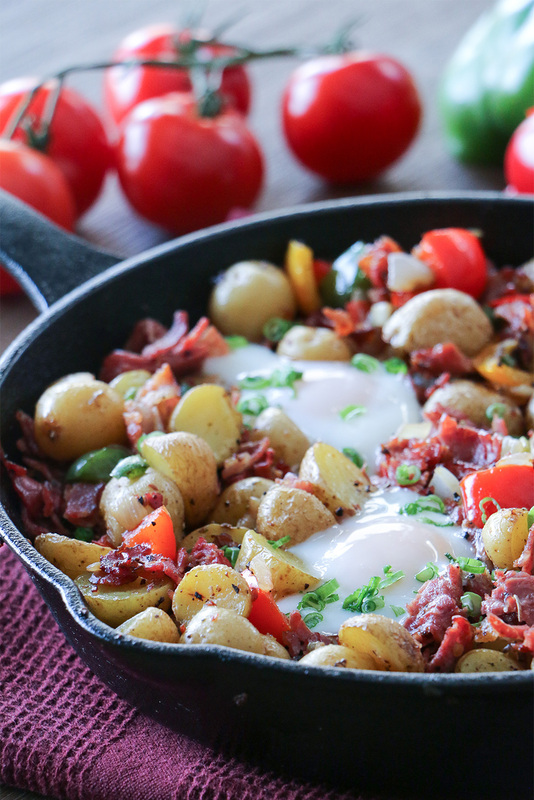 You’ve never heard of steamed hash browns have you? No, I didn’t think so. Moving on, once everything is cooked, browned, and yummy looking, the only way to make this dish better is to add eggs. Make some wells in the mixture and nestle those eggs in there. 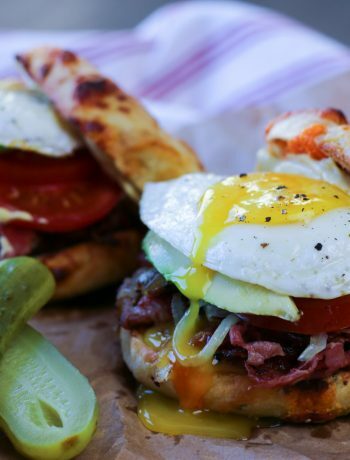 Soft, runny, yolky eggs added to anything make a dish ten times better, well at least in my books. 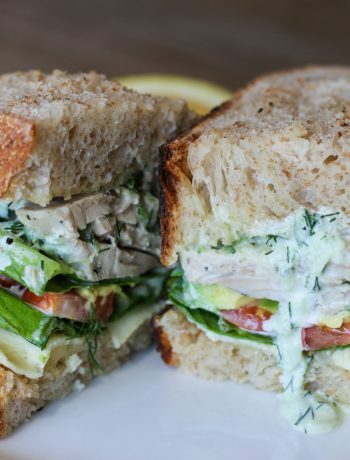 The best way to cook this masterpiece is covered in a convection oven. For my oven, I set it to 350 degrees Fahrenheit and hit the convection button which auto adjusts the oven to 325 F. If you don’t have a convection setting, 350 F is fine. It’s my standard go-to temperature setting and it hasn’t failed me yet! If you don’t have a lid that fits your cast iron skillet, you can use some tin foil but make sure doesn’t rupture the fragile yolk during baking. Alternatively you can bake it uncovered to allow for additional browning, I usually do this if I have cheese on top, but sadly someone ate the last of the Parmesan petals, I won’t name names… Kevin . But I digress… So toss the pan (not literally, I don’t need anyone getting injured from my first recipe post) into the oven and let the oven do its thing. When the oven dinger goes off, take out the cast iron skillet and embrace those jiggly white eggs. Garnish with some green onions, add some fresh cracked pepper to it and dive on it, but be careful the skillet is hot! I have a tendency to add Valentina’s hot sauce to everything and I did to this as well. 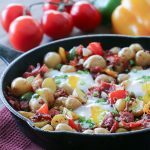 Easy Montreal smoked meat breakfast hash with sauteed vegetables and soft baked eggs. Add the potatoes to a microwave safe dish and microwave uncovered on the highest setting for about 5 minutes. Gently stir the potatoes and microwave for another 3 to 5 minutes until they and are soft in the centre and can be easily pierced with a fork. When done, set aside. 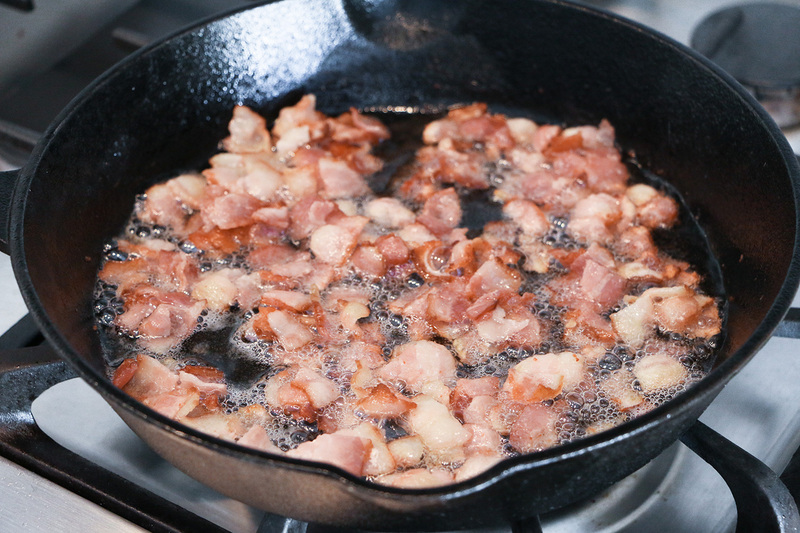 Add the bacon to the cast iron skillet and cook on medium-low heat until the bacon is crisp and browned (not burnt!). Place the cooked bacon on a paper towel lined plate to absorb the extra grease. Reserve some leftover bacon grease into a small bowl, but leave enough in the skillet to cook the remaining ingredients. Add the onions and cook on medium heat for about 2 minutes. Add garlic, jalapeños, bell peppers, and Montréal smoked meat. Cook until the vegetables are tender. When done, pour the mixture into a separate bowl and set aside. 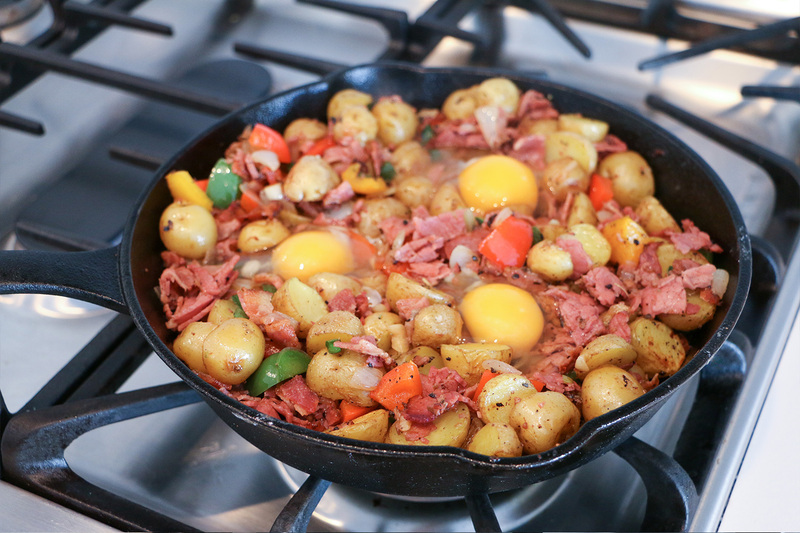 Add enough reserved bacon grease to coat the skillet and toss in the baby potatoes. Cook the potatoes for about 10 minutes or until they are lightly browned. 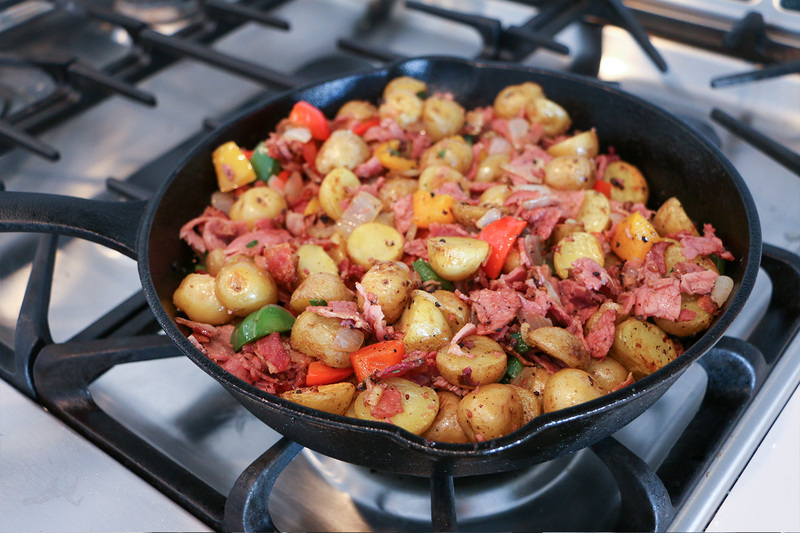 Combine the bacon, vegetables, and smoked meat back into the pan. Season with salt and pepper to taste. Remember the smoked meat and bacon are quite salty themselves, so don’t add too much salt! Stir in some fresh thyme and rosemary. With a spoon make 3 wells in the potato mixture and crack an egg into each well. Be careful to not break the yolks. Put the cast iron skillet in the oven and cook for 8 to 10 mins covered. Check how the eggs are doing at the 8 minute mark, the eggs should be soft poached and jiggly. Garnish with green onions and freshly ground pepper.